Your news here? Mail me! [22 Jun 11] :: Bugatti Galibier --> Bugatti Royale? [22 Jun 11] :: Bugatti type 51 at the Brouwers Boulevard Sprint. This weekend will see the Brouwers Boulevard Sprint in Deventer, the Netherlands. Some nice cars will show, like a Bugatti type 51, a Alvis (Speed 20, Speed 25, 1270), Talbot (105, Lago), Veritas (Meteor Monoposto, RS 2000), Riley (TT Sprite), Porsche (356) and De Tomaso (Pantera). Presentation is by Bert van den Dool, which makes for highly enthusiastic entertainment. 26th of June, 2011, city centre of Deventer, Netherlands. During a practice run, one of the competitors, driving a DeTomaso Pantera, lost control, ending in a watching crowd of competitors. 5 people got seriously injured, and were airlifted to nearby hospitals. It is said that one of the injured is Bert van den Dool, presenter of many car related activities, among them this sprint, and the sprint at Het Loo. Let us hope this accident will not lead to the disappearance of this kind of events, although it is questionable whether Deventer will see another of these events, as this was the first edition, therefore a try-out, which sadly went terribly wrong. During the night one of the victims passed away. A real drama. 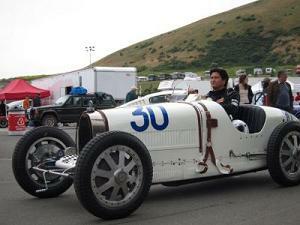 Just participated in the Sonoma Historic Motorsports Reunion on June 5, 2011 at Infineon Raceway in Sonoma, California with 37265. Started in 7th place. There were 4 other Bugattis in the field with T35B (Bill Lyons) starting in 8th, T39A (Charlie Shalvoy) starting in 9th, T35B (Mike Gertner) and T57 (Mike Cleary) starting further back. [05 Jan 11] :: New Galibier a pimped Audi? Green technology? The new Bugatti Galibier, which first was promised to be a complete new car, not sharing platform or any other part with other VW brand cars, soon became a car based on the Bentley Mulsanne. (see previous news postings). 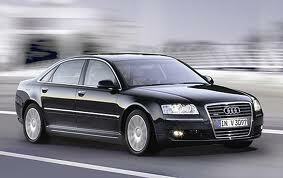 Now rumours are spread that the new Galibier will be based on the Audi A8, another step down the ladder. Another rumour, fitting in the first one, is that the car will get "green" technology, to make it more accepted in the expected customer base. Can these rumours be true? The current customer base seemingly does not care about green, they care about pumping as much fuel as possible through their Veyron engines. Also, with expected number of cars to be produced, it should be possible to attract customers with the same attitude. Not green, but ultimate power, and ultimate bragging factor. If we extract the recent rumours, will we all be driving electric powered, VW Polo based Bugattis in 2020? Last week was a busy week for many Bugattistes. This started with an article on a Bugatti type 43 in Retroviseur. 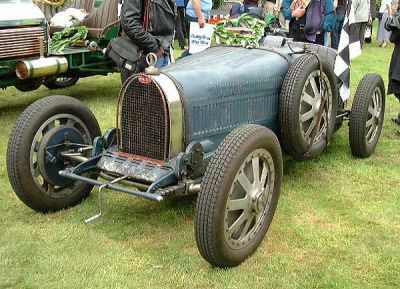 This Bugatti was soon to be auctioned, actually this will happen next saturday. 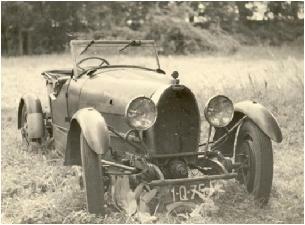 The article stated that this Bugatti was once owned by Michel Dovaz. Until last week no-one took notice of this statement, until Kees Jansen (BCN) asked Ard op de Weegh (Sleeping Beauties) how many Bugatti type 43 cars Mr. Dovaz owned. Dovaz owned only one single type 43, and it got stolen in 1975, never to be seen again. Curious on what they found? Check the Bugattibuilder.com forum, for background information and an article by Ard op de Weegh. Direct link to the Dovaz T43 thread. According to Piech, who claims he has driven the "new Veyron" already, the next version has 1200 HP. this would explain why the Bugatti Galibier would be built in a seperate, to be built atelier. -there is already a prototype. This would explain the photos that were shown on the forum, of a Veyron with lots of added sensors. 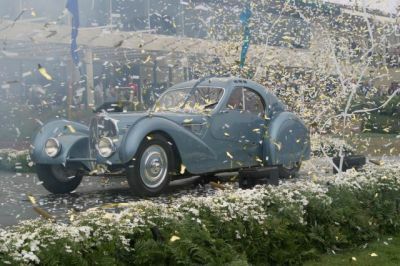 The Bugatti Atlantic of the late Peter Williamson is confirmed to have been sold in a private transactio to Peter Mullin, owner of the Mullin Museum in California. An exact figure has not been given, but it is stated that this is between 30 and 40 million dollar. This makes this stunning car the most expensive car in the world. The Williamson Atlantic is one of 3 surviving Atlantics. Experts are not sure on the amount of Bugatti Atlantics built, figures range from 4 to 6. This, however, is food for continuous debate. Without doubt the Williamson Atlantic is the most original car, as it has not seen any major mishaps in its history.